Nava (Ninth); Acharya (Guru or preceptor); Pithru (Father); Subham (Auspicious); Poorva Bhagya (Previous luck); Pooja (Worship); Tapas (Penance), Dharma (Virtue); Pauthra (Grand Son); Japa (Prayer); Daiva Upasana (Spiritual initiation); Arya Vamsa (Noble family); Bhagya (Fortune). Ninth House represents godliness, fortune, worship, legal matters, dharmic acts, virtue, generosity, tirthas (Centers of holy rivers), medicinal drugs, science, mental purity, acquisition of learning, affluence, policy, moral story, horses, elephants, prosperity, coronation halls, town halls, assembly halls, circulation of money, righteousness, preceptor, grandchildren, metaphysical studies, imagination and intuition, religious devotion, law, sympathy, philosophy, science and literature, lasting fame, leadership, charities, communication with spirits, ghosts and long journeys, foreign travels and father. According to “Bhattotpala” in “Prasnagnana”, Ninth House represents wells, lakes, tanks, watersheds, temples, monetary vows, pilgrimage and meritorious deeds. Kalidasa says that charity, virtue, visits to holy places, association with good people, vedic sacrifice, good conduct, purity of mind, reverence to elders, penance, medicinal, drug, God’s worship, acquisition of higher learning, dignity, mythology, moral study, long travel, ancestral property, horses, elephants and buffaloes (connected with religious purposes), coronation hall and circulation of money. Ninth House is also known as the “House of Faith, Wisdom and Divine Worship”. It is considered as an auspicious house as it is based on the fortune of current life through the past life’s deeds. Everyone is entitled to reap the fruits based on his karma or deeds done in the previous life. Hence Ninth House represents what luck and fate one carries in order to achieve the ladder of success. It also rules the philosophy, philosophical beliefs. In Western Astrology, Tenth House is considered as a House of Father whereas in Hindu Astrology, Ninth House is considered as a House of Father. After examining the predictions from Ninth and Tenth House for the father, it is also found that predictions were right as per Ninth House rather than Tenth House. Hence Ninth House indicates actual House of Father of the native whereas Tenth House tells about the longevity of the father. Hindus have attributed to the Ninth House as holy places, wells, circular reservoirs, sacrifices and charity. All holy places like temples, mosques, churches and all religious institutions are seen through Ninth House in Astrology. It is the house of intuition and pure reason. Ninth House represents higher education, higher learning, thoughts and higher knowledge. It also represents research, invention, discovery, exploration and submission of thesis. Hinduism calls this house as the House of Dharma. As per Astrology books, Ninth House deals with publishing, especially relating to religion, science, law, philosophy, travel, international affairs etc. It also denotes the association of good people, reverence and devotion to God and elders, previous birth, good deeds (punya) and blessings received from family. The author of Satya Samhita says that the rest house and favors from others are to be investigated from this house of the horoscope. In Mundane Astrology, Ninth House represents judicial system, Supreme court, judges, law, courts, international laws, litigation, morality, religion, diplomats, foreign missions, progress and development. It relates to long distance travels like air travel, shipping, sea traffic, foreign import and export, high seas and weather conditions around the coasts. It represents United Nations, World organization, ministry of foreign affairs, diplomatic, relation with foreign countries, treatise with foreign countries, shipping, navy, naval affairs. It deals with the publishing industry- advertising and public relations. Religion, mosques, temples, churches, religious books like veda, puranas, Bible, Quran. It also shows commercial power, long distance communications like cable, wire, radio, T.V etc. Basically, it represents the Ministry of Law in Mundane Astrology. The other significance of Ninth House can be correlated with different houses of the horoscope. It represents teachers, preachers, pilgrimage, etc. While helping the poor also, our Ninth House gets activated. It also tells more about foreign travels, spirituality connected to the universe, philosophy, gurus, postgraduate education, PhD, bosses, hidden force of powers, ability to earn money from foreign places, destruction of family wealth, end of family wealth, house of rise and fall of luck. Spouse of your siblings; health, illness, diseases and debt of your mother; obstacles or hurdles which your mother runs into the life; grand children, creative expression of your own children, speculative gains of your own children, activation of diseases, enemies etc. are seen through Ninth House of the horoscope. Residence, real estate of maternal grand uncle, siblings of your spouse, communication style of your spouse, writing ability of your spouse, hidden hand or powerful hands behind you, loss of work and job or career, travelling for your career perspective, younger siblings of your father and communication skill of father, gain of father, career, profession and status of spiritual paternal grandmother. It represents the Karma of spiritual life, major struggle in spiritual path, spiritual path, places of charity, storage of water etc. As per Lal Kitab, this house represents wealth or inheritance obtained from father, grandfather and great grandfather, fortune, religion, karma, floor of home, elder person of the family, old house, watery animals like frog etc. Prosperity and happiness are seen through the Ninth House of the horoscope. If there is no planet in Third and Fifth House, then the planets occupying this house will remain inactive. Planets in the Fifth House will activate this house’s planets. 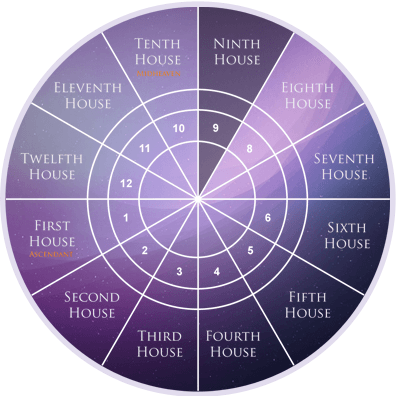 Therefore, Ninth House is one of the most prominent houses. 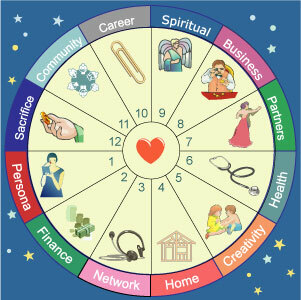 Your fortune and how much you get in your whole life span are all seen through the Ninth House of the horoscope. One will not receive more than his luck or fortune or anything before time.